Simply put, a spotting scope is a more powerful optic used along your less powerful, rifle mounted optic. They are usually mounted to a base or short tripod and may range in power up 60x or more where rifle mounted scopes are generally less than 20x, often less than 15x. Not only will a spotting scope allow you to get a better view of your target but they will often have a reticle that can be used as an optical rangefinder. If the intended use is for shooting, be selective with your decision as a spotting scope for birding or other more peaceful pursuits may not have a reticle at all. If you are looking for a spotting scope for digiscoping, where you use the scope as a makeshift magnifier for your camera, one without a reticle would be preferred. Spotting scopes are often more powerful than binoculars which are often used for similar purposes. At its core, a spotting scope is a telescope with special modifications to make it usable in daylight. It would be in the lower range of telescope power but is far more powerful most other magnifying optics that are daylight usable. When looking at a spotting scope you will see a notation like 20x60mm or 18-45x60mm. In this case, we are looking for the numbers before the x which denote the magnification of the scope. If the number is a single number like the 20 it is a fixed power scope. If the number is hyphenated like the 18-45 it is a variable power scope. All other considerations equal, a variable scope is more versatile. When determining the maximum power you need in a spotting scope, you will have to consider your use. If you are using a spotting scope for target shooting, the more power you have the better. For other uses where you are using the scope to scan an area, having a lower powered scope may be better. I prefer something in the 25 or 30x range for deer hunting if I use a fixed power. 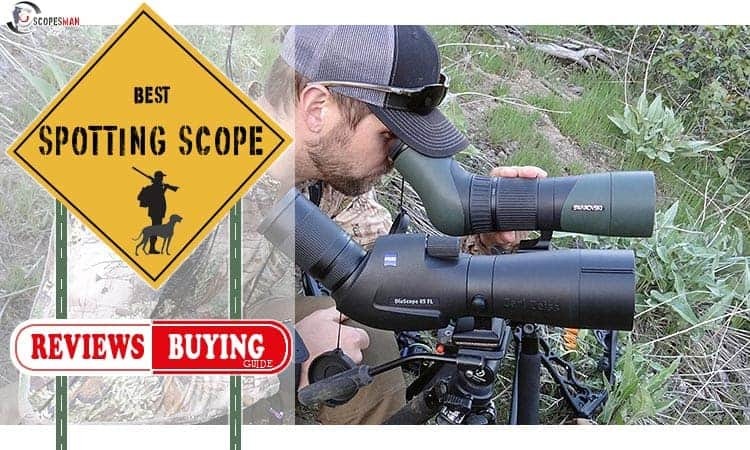 The best bet is a variable power scope that has a low-end magnification you can use to scan and then dial up the magnification to get a better look. The number in the examples above represents the size of the objective lens. The larger the lens the more light can enter the scope. A larger objective lens will work better in low-light conditions. A large objective lens will also have a larger field of view allowing you to see a broader image than one with a smaller lens. Having a large field of view is always a good idea. If all else is equal, a large lens is always better but the quality of that lenses will be more important overall. There are four types of lens coatings available on spotting scopes. The idea behind the coating is to prevent glare and increase the light gathering ability of a scope. The highest end scopes will allow you to see better in low-light than you can with the naked eye. The four types of coating in are: Coated, Fully Coated, Multi-Coated, Fully Multi-Coated. While these go up in price from the first to last, they also go up significantly in quality. Having at least a coated lens should be the standard but go for the best you can afford. Some cheaper brands will offer multi-coated lenses as a sales gimmick to overcome otherwise shoddy optics. Be cautious of a multi-coated optic that is significantly cheaper than its regular coated counterparts. There are two styles of bodies available on a spotting scope that specifically deals with the orientation of the eyepiece. The type you choose will be a very important decision that will govern how easy the scope is to use for different purposes. A straight scope is great for a handheld option but using one from a shooting bench can be more difficult but not as difficult as using an angled scope as a handheld option. Either way could cause neck strain. If you plan to use your spotting scope as a rangefinder, you will have to have a good reticle that will allow you to measure. This is the method used by military snipers but with the growth or laser rangefinder technology, most other long-range shooters are opting to use technology to their advantage. Unless you need a spotting scope for target shooting specifically, a reticle may just be visual clutter. If you do use a reticle, learning to read the specific reticle you choose will be a time-consuming endeavor. Make sure to do your research and practice at known distances with objects of a known height. Eye relief is the distance you can hold your eye away from the eyepiece and still get the full field of view. Eye relief of less than 15mm can make it harder to get your head in the right position to use the scope if it's at an odd angle. Scopes of that level of eye relief are often impossible to use if you wear glasses. Some spotting scopes are quite an investment with the best scopes reaching well over a thousand dollars. While these scopes really are worth the money, protecting your investment become very important at that cost. Most scopes have some sort of rubber coating to partially weather-proof them while also protecting them from any rough treatment they may get in the field. If the scope you are looking at lacks any weatherproofing, move on. A well-made scope that has good weather protection can last multiple lifetimes. It's best not to risk one without it. Vortex is a current leader in the optics market and at the top of their line of spotting scopes sits the Viper. For the money, there are no scopes better and some scopes costing far more than the Viper fail to meet the same standards. Vortex uses their own proprietary lens coatings on top of already outstanding glass that produce on of the clearest images available in a spotting scope under 1000 bucks. They have coupled this with their own prism technology to ensure that you get the best light transmission from the sizable objective lens making this one of the brightest scopes on the market, even in low light and twilight. While this isnâ€™t exactly a light and portable scope, it is field ready with a nitrogen purged interior that keeps weather and fog out. The exterior is clad in a rubberized armor that will minimize the abuse that will happen in the outdoors. If you want a clear picture to line up those longest shots, the Vortex has made this spotting scope for 1000 yards or more in mind. Whatever is out there, you will see it. Whether or not you have heard of them, Athlon has become quite the respected name in the optics world. Much like Vortex they are doing things with glass that should cost hundreds more than what it does. They offer a very wide range of high-quality optics at prices far more reasonable than their quality should permit. The glass in the Ares is simply amazing and when coupled with a prism designed after those used in high end telescopes, you get top notch images with no sacrifice of power. The multi-coating and large objective deliver great image quality that looks almost like a photograph. For the money you arenâ€™t going to get a scope better than this and no doubt about it. If you are looking for a quality long range spotting scope with all the features you want but a price that you can live with, the Ares is a solid choice. Much like the Vortex spotting scope, it has pretty much anything that you can pack into a spotting scope and should last multiple lifetimes with a little care. This scope is lighter than the Vortex and has all the protection it should need to work hard in the field. I told you that Vortex was making waves so it shouldnâ€™t surprise you that they have made a second entry on this list. When it comes to value for your buck, you can bet Vortex is going to lead the pack. Much like their higher end scope, if you want the best damn spotting scope under 500 bucks this is it. Many of the features found on the Viper can be found on the Diamondback. The combination of amazing prism technology combined with fully multi-coated glass give you a great image with little concern for things like wash-out or glare while the large objective lens keeps things crisp and bright. In a scope at this price, the quality in nearly unheard of. This is also a scope that will hold up well enough to take anywhere and is more portable than the Viper with a lighter weight and more convenient size. No doubt the Diamondback is a very affordable spotting scope that will last multiple lifetimes. I own a variety of Vortex optics and have had no issues with any of them. These are my favorite spotting scopes for hunting and any activity out in the weather. Vanguard is an overlooked company in the shooting world but has been making good quality products in a variety of optics markets for over 30 years. While this will do well in the world of shooting sports its also a great multi-use scope that will lend its self well to a large variety of pursuits. Donâ€™t be fooled by the low price, this is a scope that stands up to the best on the market. It may not have the blow away power of the Vortex scope but it makes up for it with some absolutely amazing glass that has Vanguards own multi-coat recipe. The objective is large enough to keep the scope bright and images vibrant. Things like sun spotting and glare are hardly an issue. If you are looking for an inexpensive spotting scope for 300 yard shooting competitions, you wonâ€™t find many better. I love the styling of the vanguard. It has just enough of a tactical look to keep me happy while still fitting in perfectly well with any other outside endeavor. It is rugged and fully weatherproofed. While it may not be as tough as the Vortex optics, it will still hold up well enough to engage in any of your outdoor activities. If you read pretty much any hunting spotting scope reviews pages, you are going to see Bushnell at least once. Check the hunting forums and you will find the same thing. They have never been known as an industry best but they make a solid product at a great price. To begin with, this is a very rugged scope that can take the punishment of the weather we all find ourselves in. It is fully weatherproof being nitrogen purged from the factory and will resist fog with ease. Combine that with the large objective lens and you get out there far enough to pick out the target you are after. If your budget is for a spotting scope under 300 bucks, the XLT is an outstanding spotting scope. It may not have everything the high-priced scopes have but they cost FAR less than some of their competitors. This is a very bright scope, even if the optics are a little prone to glare issues but its tough as a tank and will provide you with years of service. This company has snuck its way into the spotting scope world from the opposite direction. Most companies do some lower powered rifle scopes and build from there. Meade Instruments has made high powered telescopes for years and have brought down the power so we can have a terrestrial version. To get it out of the way, this isnâ€™t a rugged scope like many of the others and will fair less well if its subjected to abuse. That said, you wonâ€™t find glass anywhere near this good for anything approaching this price. The coated lenses provide amazing light transmission and the huge 100mm objective lens keeps the scope bright on even the worse days. It is fully water and fog proof and holds up well to harsh temperatures and with a little care does a job so much better than its price reflects. In a pure value for your money case, this may be the best scope on this list. If you are into digiscoping or other less demanding sports, Meade Instruments is worth a good look. Let's get it out of the way and say Barska doesnâ€™t have the best reputation in optics. Some of their rifle scopes are probably not worth the metal they are made of. The main issue with those optics is the inability to handle the shock of a rifle's recoil. Luckily, a spotting scope doesnâ€™t have to deal with that kind of abuse. While the Colorado lacks the high-quality glass of some of the other scopes, that huge 90mm objective lens keeps the images bright and crisp with plenty of fine detail to pick out your target at any reasonable range. The glass is fully coated which helps avoid issues with brightness and will perform better than many other spotting scopes under 200 dollars. Of course, the main selling point of this scope is the amazing magnification. Something you wonâ€™t get close to with any other brand. If you are willing to deal with a scope that has some small fogging issues on colder days and may not handle the abuse as well as some higher end scopes, the 90x90 Colorado will get you closer to a target than any scope anywhere near this price. When you start looking at spotting scopes in this price range, there are always going to be sacrifices. If the sacrifice you canâ€™t bear to make is in durability, I have to agree with you 100%. At the same time, you donâ€™t want to give up too much quality or what's the purpose of having a spotting scope in the first place? The Bushnell Sentry is a super tough, compact, and rugged spotting scope that does its job better than any other scope in its price range. Sure, itâ€™s not as powerful as the bigger scopes but thatâ€™s the tradeoff. You are still getting great glass that is multi-coated and will give you a great image that is clear and vibrant at distances farther than any other optic in your arsenal. You arenâ€™t going to find too many scopes that are have the quality armor and are nitrogen purged with full fog and weatherproofing for anywhere near this price. If want a scope you can slog through the mud with and give it a quick wipe off before you get on target, this is absolutely the best scope for you. So, what is a spotting scope? Basically, it's just a more rugged telescope that is easily transportable. Much like Meade Instruments, Celestron has come at the spotting scope from the top down. It's just a telescope with less power, in this case, it's an actual a small telescope. If you want to reach out there with some good, clear optics the Mini Mak will get you there. When I say clear, I mean the coated lenses are super clear and bring distant objects in focus with no issue while the massive objective keeps everything crisp and bright. When I say it will get you there, I mean the 75x zoom gets you up close and personal at huge distances. For a budget spotting scope, you couldnâ€™t do better and when you are done in the field or at the range you can wow your kids with a view of the moon they have never seen before. This may not be a durable scope and it lacks any weatherproofing whatsoever but it will get you over a 1000 yards of view distance for a price that is very hard to beat. I am not going to rehash everything I said about the last Barska here but it all still applies. This isnâ€™t a great scope in the range of scopes we have here but if you want a usable spotting scope under 100 bucks, well under in this case, Barska is about the best on the market. Actually, finding a scope that has fully coated lenses with adequate glass at this price should be impossible. Combine that with a 60mm objective lens and you get enough power and clarity to easily read targets out to most any distance you are ever going to need. It isnâ€™t a Vortex but it also costs a fraction of the amount. I see a ton of these at the range, many that have been around for years and years. If money is tight, Barska does the job. They arenâ€™t rugged and the weatherproofing is a little lacking but if you can take care of your gear and you are getting a scope for light use, there is no reason that Barska wonâ€™t do the job. Though most of the spotting scopes are weatherproof or at least resistant, that isnâ€™t the only weather-related concern we will have. Rain will greatly affect visibility at high magnification. If you use your scope on a rainy day, zoom the scope out to its minimum magnification to get the best view. Humidity and heat can have a similar effect. If you are looking through the scope and see wavy heat lines, you have a mirage effect. Decreasing the power or opting for a less powerful scope should clear that up. Some days it's all but impossible to do. Any time you have magnification, sunlight can do strange things to the view. Mostly its wash out but it can also severely damage your vision of you have a strong reflection off water or similar surfaces. Multi-Coated lenses help but arenâ€™t a universal answer. Setting up off the line of the sun or putting yourself at an angle can do wonders, especially at dawn and dusk. I carry a couple of microfiber towels and several small lens cleaning cloths with me in my scope case. I make sure itâ€™s try when I put it up and keep the lenses clean. Donâ€™t store it in the case, especially if the case has absorbed moisture. If it has lens covers, use them! At even low-level zoom, the natural shaking of your hands can frustrate any attempt to use your scope. Getting a solid, stable tripod will help more than anything else. Choose one that is adjustable for rough terrain if you plan on using your scope in the field. You have never had a headache like the one you can get from too much time spent on a scope. Be sure to look up from time to time and take extended breaks after prolonged use. Itâ€™s hard to remember to do this if you get locked on to an area. A spotting scope excels at getting a clear view of distant objects but use other tools like binoculars to scan with until you need to get a really good view. If you are looking for a way to stretch your vision out to farther distances, there is no tool that will do it like a spotting scope. Most people would benefit from having one in their bag of tricks for when they need it. Get the best one you can. This is a situation where â€˜you get what you pay forâ€™ really means something. While the Bushnell will do the job, when used beside a Vortex or Athlon, there is no comparison. If you can save or spend a little more to get the better scope, by all means, that is what you should do. The cheaper scopes are there if you have no other choice. If you arenâ€™t a serious spotting scope user, the cheaper scopes work. They are great for those just getting into the hobby. I would hesitate to go cheaper than the Bushnell Sentry myself but it's up to each person to make the best decision on quality vs price that they can. Either way, the scopes on this list are selected to be the best spotting scope in their range that you can get! Scopesman.com is a participant in the Amazon Services LLC Associates Program, an affiliate advertising program designed to provide a means for sites to earn advertising fees by advertising and linking to Amazon.com. Amazon, the Amazon logo, AmazonSupply, and the AmazonSupply logo are trademarks of Amazon.com, Inc. or its affiliates. As an Amazon Associate I earn from qualifying purchases. We do not specifically market to children under 13.